A landmark anthology of Australian literary writing across all genres from over two centuries, this is an authoritative collection more than six years in the making, providing a window onto Australian culture. An essential addition to every Australian's library. Some of the best, most significant writing produced in Australia over more than two centuries is gathered in this landmark anthology. Covering all genres - from fiction, poetry and drama to diaries, letters, essays and speech - the anthology maps the development of one of the great literatures in English in all its energy and variety. The writing reflects the diverse experiences of Australians in their encounter with their extraordinary environment and with themselves. This is literature of struggle, conflict and creative survival. It is literature of lives lived at the extremes, of frontiers between cultures, of new dimensions of experience, where imagination expands. This rich, informative and entertaining collection charts the formation of an Australian voice that draws inventively on Indigenous words, migrant speech and slang, with a cheeky, subversive humour always to the fore. For the first time, Aboriginal writings are interleaved with other English-language writings throughout-from Bennelong's 1796 letter to the contemporary flowering of Indigenous fiction and poetry - setting up an exchange that reveals Australian history in stark new ways. 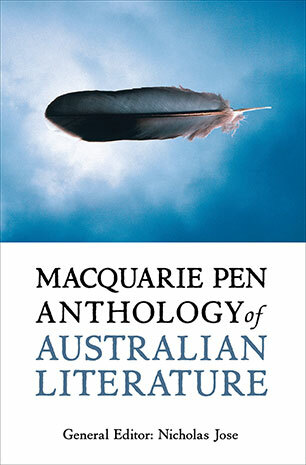 From vivid settler accounts to haunting gothic tales, from raw protest to feisty urban satire and playful literary experiment, from passionate love poetry to moving memoir, the Macquarie PEN Anthology of Australian Literature reflects the creative eloquence of a society. Chosen by a team of expert editors, who have provided illuminating essays about their selections, and with more than 500 works from over 300 authors, it is an authoritative survey and a rich world of reading to be enjoyed. The Macquarie PEN Anthology of Australian Literature is published in association with Macquarie University, Sydney and Sydney Centre of International PEN. General editor Nicholas Jose is a novelist, essayist and scholar. He is Chair in Writing at the University of Western Sydney.